Find My Workspace lists over 95% of the business centres market in Slough. Simply click Request Quote to check pricing for one office, or Add to Basket for multiple offices. This modern, smart and spacious offices have the benefit of free 24/7 access, secure PIN-code entry and parking available on site. A flexible choice of a furnished ‘all inclusive’ office (including business rates, utilities, Wi-Fi and telephone) or a more tailored offering suitable for the customer’s needs. 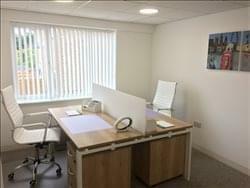 Free use of the modern meeting room and a large communal modern kitchen available on site. Being based in a self-storage facility, the offices allow the convenience for businesses having both the working space and business stock or documents under one roof.